Space F!ght have been selected as one of the groups to be featured at this year's MIRA Live Visual Arts Festival in Barcelona in November. The festival runs from 6-15th November and uses different venues throughout Barcelona to showcase different cultural initiatives including concerts, installations, workshops and discussions. Their focus is on innovation and encouraging cross-discipline collaborations across artforms. 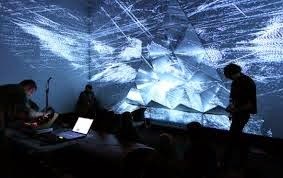 Space F!ght, a group based in the North featuring James Mainwaring, Radek Rudnicki, Jakub Hader and Tom Adams, have built up a strong following through their use of live music, electronics and live visual mapping. For more information, see the MIRA Festival website.